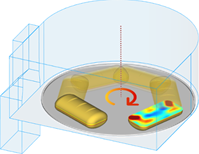 Microwave heating analysis, including loads rotation and movement along user defined trajectory, source frequency tuning to meet application specific requirements (e.g. maximising matching in microwave power applications with solid state power sources), source parameters switching, heat transfer analysis, and material parameters modification as a function of dissipated power. See also Basic Heating Module for more information. Beef burger in a cavity oven. Microwave domestic oven with heating processing. Microwave domestic oven with heating process and heat flow effect. Microwave domestic oven with heating process and automatic source frequency tuning. Microwave domestic oven with heating process and load rotation. Microwave domestic oven with heating process and two loads rotation. Microwave domestic oven with heating process and two separate loads rotation. Microwave domestic oven with heating process and two separate loads movement.